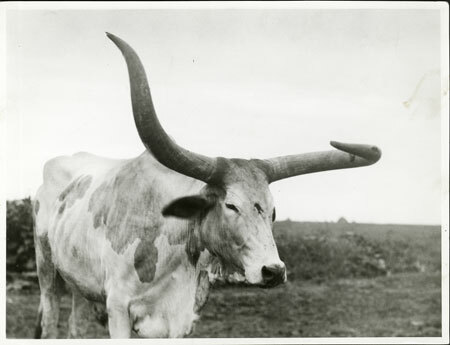 A close-up image of an ox with light colouring and exhibiting the training of the left horn over the muzzle known as ma gut. Such training of horns was a process carried out by Nuer men on their favourite beasts by cutting away at one side of the horn, against which the horn grows to obtain an aesthetically pleasing shape. This training is mirrored in the male practice of binding the left arm with metal bands called thiau, both of which are often carried out soon after initiation. The favourite ox of a man was the subject of his praise songs and from whom he took his ox-name on initiation and thereby his social identity as a man of the tribe. This image was probably taken among the Eastern Jikany Nuer by F. D. Corfield, District Comissioner at Nasir on the Sobat River in Upper Nile Province during Evans-Pritchard's fieldwork. Morton, Chris. "Nuer ox with trained horn" Southern Sudan Project (in development). 03 Jan. 2006. Pitt Rivers Museum. <http://southernsudan.prm.ox.ac.uk/details/1998.346.367/>.